Arcas was a son of Zeus, and a legendary king of Greek mythology, after whom, the region of Arcadia is named. Arcas was a son of Zeus, born to Callisto, daughter of King Lycaon of Pelasgia. 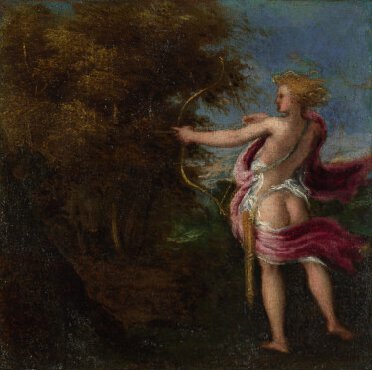 Zeus would seduce Callisto though, not in the palace of her father but in the woods, for Callisto was a part of the hunting retinue of Artemis. Artemis was a virgin goddess, and when she discovered that one of attendants had become pregnant, the goddess expelled Callisto from her retinue. Worse was to come for Callisto, and having given birth to a son of Zeus, Callisto was transformed by an angry Hera into a bear, leaving Callisto to wander through the woods she used to hunt in as a wild animal. Hera would have done the same to the son of Callisto and Zeus, or killed him, if Zeus had not intervened, whisking the new born baby away. Zeus would name his new son Arcas, and giving the baby to the messenger god Hermes, the baby was transported to the Pleiad Maia (mother of Hermes), who subsequently raised Arcas to adulthood. Some tell of how Arcas was actually raised in the court of Lycaon, and was in fact the boy killed by Lycaon and served to Zeus; but this boy was normally called a son of Lycaon, possibly Nyctimus, whilst Arcas was the grandson of Lycaon. Nyctimus would succeed Lycaon, but it was then Arcas who succeeded Nyctimus to the throne previously occupied by Lycaon. It was at this time that Pelasgia was renamed Arcadia after the new king. Arcas was said to be a good king and introduced his populace to crop cultivation, bread making and basket weaving; Arcas having been taught in the agricultural art by Triptolemus, the disciple of Demeter. Arcas would of course marry, although there is no agreement as to the name of his wife; with women named Chrysopelia, Erato, Laodameia, Leanira, and Meganira all linked with Arcas. Certainly, Arcas was father to at least three sons, Apheidas, Azan and Elatus, but a number of other children of Arcas are also named, including, Autolaus, Deiomeneia, Erymanthus, Hyperippe, Pelasgus and Triphylus. As well as being interested in agriculture, Arcas had also inherited the skill of the hunter from his mother, and the king of Arcadia would hunt in the same forests that Callisto once hunted in. ​Inevitably, one day, Arcas whilst hunting would come across his transformed mother. Callisto instantly recognised her son, and came forth to embrace him; Arcas though, did not recognise his mother, and taking up his bow and arrow, Arcas prepared to kill the beast approaching him. Zeus observed events from Mount Olympus, and not wishing to allow the tragedy of son killing mother, instantly transformed Arcas into a bear, just like Callisto. Callisto and Arcas were the further transformed by Zeus into two new constellations, Ursa Major and Ursa Minor. Hera still sought to have some sort of revenge upon her husband’s mistress and illegitimate child, and so Hera went to Tethys, the Titan wife of Oceanus, and asked that the two constellations be prevented from descending below the horizon, to drink of the waters of Oceanus, thus keeping them thirsty for ever. This indeed was what happened, for in antiquity, Ursa Major and Ursa Minor always remained above the horizon. After the transformation of Arcas, the rule of Arcadia passed to his sons, Azan, Apheidas and Elatus, with the kingdom of Arcadia divided into three. Elatus was said to have been the most powerful of the new Arcadian kings, but he would leave his portion of the kingdom to migrate to Phocis, but the descendants of Arcas would rule in Arcadia for several generations.